Chapter 8: It's a Trap! 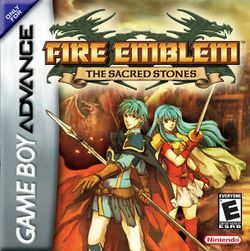 Fire Emblem: The Sacred Stones, known in Japan as Fire Emblem: Seima no Kouseki (ファイアーエムブレム 聖魔の光石, Faiaa Emuburemu: Seima no Kouseki?, "Fire Emblem: Shining Stones of Holiness and Evil"), is a tactical role-playing game for the Game Boy Advance published by Nintendo. It is the eighth game in the Fire Emblem series, the third and final game in the series to be released for the Game Boy Advance and the second game in the series to be released outside Japan. It was re-released through the Nintendo eShop on the Nintendo 3DS Virtual Console in 2011 and later the Wii U Virtual Console in 2014. The game builds on the game mechanics used in the previous two Game Boy Advance Fire Emblem titles—Fire Emblem: Fūin no Tsurugi and Fire Emblem—but takes place on a different world. Set on the continent of Magvel, the plot focuses on royal twins Princess Eirika and Prince Ephraim as they investigate why a longtime ally has chosen to invade their nation's borders and the sudden appearance of monsters all over Magvel. This page was last edited on 8 April 2017, at 05:21. This page has been accessed 62,940 times.